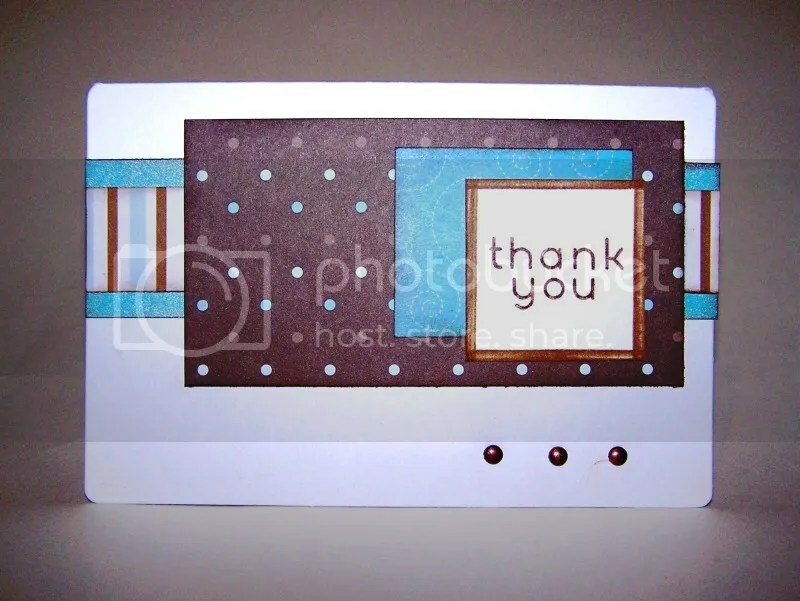 Here it is – the final post in my short series of Baby Boy Thank You cards! (You can start here to see the others.) I said this at the beginning, but it bears repeating: Most of these cards could easily be adapted. A different color scheme, a different sentiment, and they’d be perfect for other occasions. When I started making these, I wanted fairly simple, quick cards. After all, I had quite a few to make! I liked some, and didn’t love some, but these three are my favorites. I made several of each, and I will use these designs in the future for other things, though with a few changes and tweaks here and there. I love blue and brown together. My Beloved says that combination, in just about any shades, is “girly,” and won’t let me have those colors in our bedroom, so I live vicariously through my crafting. I wasn’t sure how well the combination of a hand print stamp and this sentiment would work out. I’d already cut out the oval with my Silhouette, and I don’t have a stamp positioner, so it was a lot of guessing and hoping. I like the double ribbon a lot! The top patterned ribbon adds some interest, but it was too thin and weak looking on its own. I like the amount of white space on this one, too. Nice and clean! Not really a boy card, is it? But that’s okay. I didn’t intend for all of the cards to feel masculine. This one is a nice, basic thank you that works well for a female recipient. I love the blue background. It has a subtle, white swirl stitching pattern on it. Interesting without being too busy. The sentiment really stands out due to the darker color and white mat behind it, and the ribbon is the perfect embellishment to finish things off! What can I say? I love this card. Really, really love it. The shapes and sentiment are all so super simple. Just squares and rectangles. The interest all comes from the layering and the patterns. I like the weathered, distressed look on the edge of the sentiment. I just pressed it against a stamp pad that was starting to run out of ink. I inked all of the edges of the rectangles, which takes a bit of time, but it’s easy and the effect is absolutely worth it. Without that, this card would be flat and lifeless. I think this might become a go-to sketch for me. It would be so lovely in almost any pattern collection, and I can do it all with just a cutter, one stamp, and one ink pad. That’s pretty hard to beat! Which is your favorite? 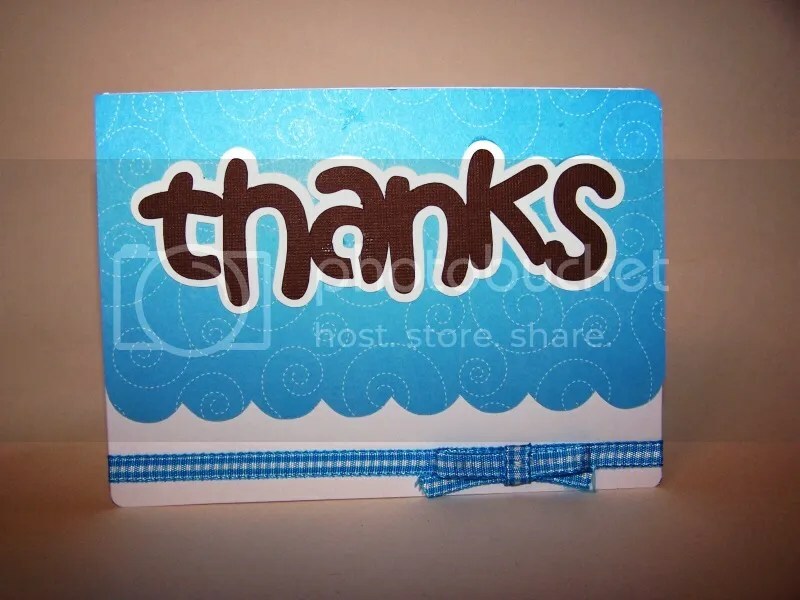 How long did it take you to get thank you cards out after a baby? I’m ashamed to admit how long it takes me. Every time, I have sworn it would be better, and every time it has not been. Granted, we’ve had an unrelated major crisis after each baby, but that’s really no excuse. Maybe next time, if there is one, I’ll finally get it done in a timely manner!